[gradTx,gradTy] = evaluateTemperatureGradient(thermalresults,xq,yq) returns the interpolated values of temperature gradients of the thermal model solution thermalresults at the 2-D points specified in xq and yq. This syntax is valid for both the steady-state and transient thermal models. [gradTx,gradTy,gradTz] = evaluateTemperatureGradient(thermalresults,xq,yq,zq) returns the interpolated temperature gradients at the 3-D points specified in xq, yq, and zq. This syntax is valid for both the steady-state and transient thermal models. [___] = evaluateTemperatureGradient(thermalresults,querypoints) returns the interpolated values of the temperature gradients at the points specified in querypoints. This syntax is valid for both the steady-state and transient thermal models. [___] = evaluateTemperatureGradient(___,iT) returns the interpolated values of the temperature gradients for the time-dependent equation at times iT. Specify iT after the input arguments in any of the previous syntaxes. 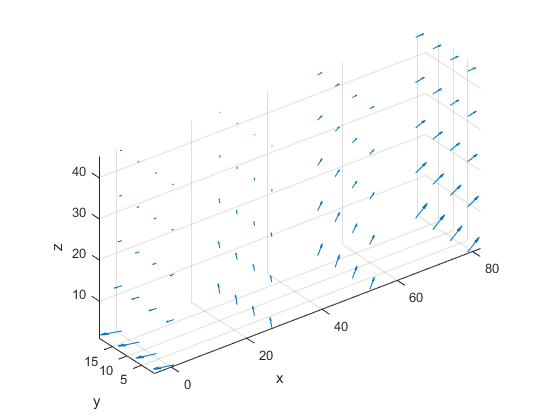 The first dimension of gradTx, gradTy, and, in 3-D case, gradTz corresponds to query points. The second dimension corresponds to time-steps iT. For a 2-D steady-state thermal model, evaluate temperature gradients at the nodal locations and at the points specified by x and y coordinates. The solver finds the temperatures and temperature gradients at the nodal locations. To access these values, use results.Temperature, results.XGradients, and so on. For example, plot the temperature gradients at nodal locations. 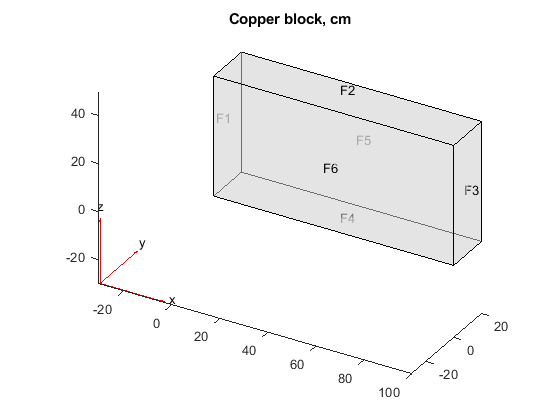 Create a grid specified by x and y coordinates, and evaluate temperature gradients to the grid. 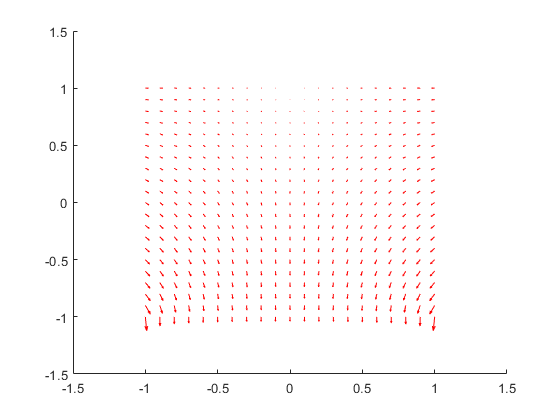 Reshape the gradTx and gradTy vectors, and plot the resulting temperature gradients. For a 3-D steady-state thermal model, evaluate temperature gradients at the nodal locations and at the points specified by x, y, and z coordinates. Apply a constant temperature of 373 K to the left side of the block (edge 1) and a constant temperature of 573 K to the right side of the block. The solver finds the values of temperatures and temperature gradients at the nodal locations. To access these values, use results.Temperature, results.XGradients, and so on. Create a grid specified by x, y, and z coordinates, and evaluate temperature gradients to the grid. 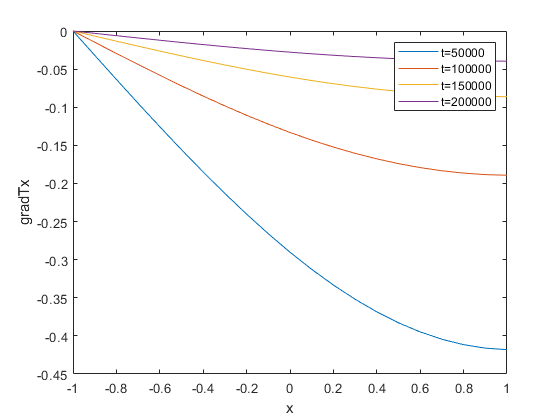 Reshape the gradTx, gradTy, and gradTz vectors, and plot the resulting temperature gradients. 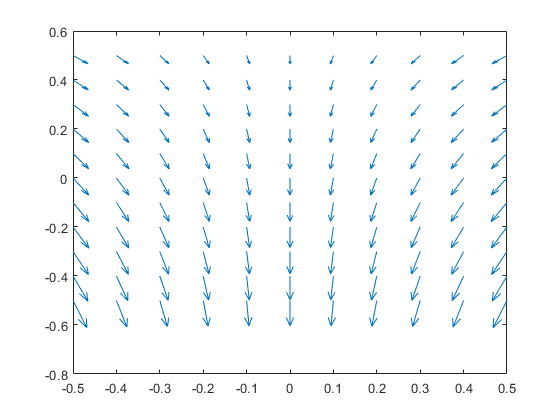 Solve a 2-D transient heat transfer problem on a square domain and compute temperature gradients at the convective boundary. Plot the interpolated gradient component gradTx along the x axis for the following values from the time interval tlist. x-coordinate query points, specified as a real array. evaluateTemperatureGradient evaluates temperature gradient at the 2-D coordinate points [xq(i) yq(i)] or at the 3-D coordinate points [xq(i) yq(i) zq(i)]. So xq, yq, and (if present) zq must have the same number of entries. evaluateTemperatureGradient converts query points to column vectors xq(:), yq(:), and (if present) zq(:). It returns the temperature gradient in a form of a column vector of the same size. To ensure that the dimensions of the returned solution is consistent with the dimensions of the original query points, use reshape. For example, use gradTx = reshape(gradTx,size(xq)). y-coordinate query points, specified as a real array. evaluateTemperatureGradient evaluates the temperature gradient at the 2-D coordinate points [xq(i) yq(i)] or at the 3-D coordinate points [xq(i) yq(i) zq(i)]. So xq, yq, and (if present) zq must have the same number of entries. evaluateTemperatureGradient converts query points to column vectors xq(:), yq(:), and (if present) zq(:). It returns the temperature gradient in a form of a column vector of the same size. To ensure that the dimensions of the returned solution is consistent with the dimensions of the original query points, use reshape. For example, use gradTy = reshape(gradTy,size(yq)). z-coordinate query points, specified as a real array. evaluateTemperatureGradient evaluates the temperature gradient at the 3-D coordinate points [xq(i) yq(i) zq(i)]. So xq, yq, and zq must have the same number of entries. evaluateTemperatureGradient converts query points to column vectors xq(:), yq(:), and (if present) zq(:). It returns the temperature gradient in a form of a column vector of the same size. To ensure that the dimensions of the returned solution is consistent with the dimensions of the original query points, use reshape. For example, use gradTz = reshape(gradTz,size(zq)). Query points, specified as a real matrix with either two rows for 2-D geometry, or three rows for 3-D geometry. evaluateTemperatureGradient evaluates the temperature gradient at the coordinate points querypoints(:,i), so each column of querypoints contains exactly one 2-D or 3-D query point. 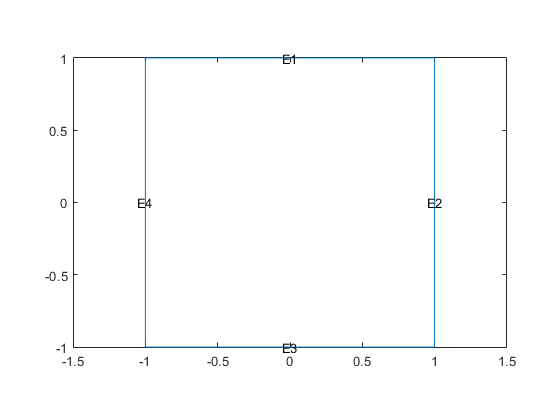 x-component of the temperature gradient, returned as a matrix. For query points that are outside the geometry, gradTx = NaN. 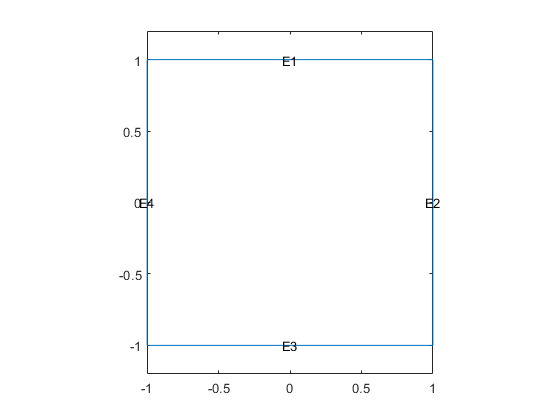 y-component of the temperature gradient, returned as a matrix. For query points that are outside the geometry, gradTy = NaN. z-component of the temperature gradient, returned as a matrix. For query points that are outside the geometry, gradTz = NaN.